Between global warming and massive droughts, you’re growing evermore concerned about the state of our planet. But now you’re preparing to plan a wedding, and you know you’ll likely have to cut some of those eco-friendly corners in order to save on time and budgeting. We’re here to tell you that you can do both! 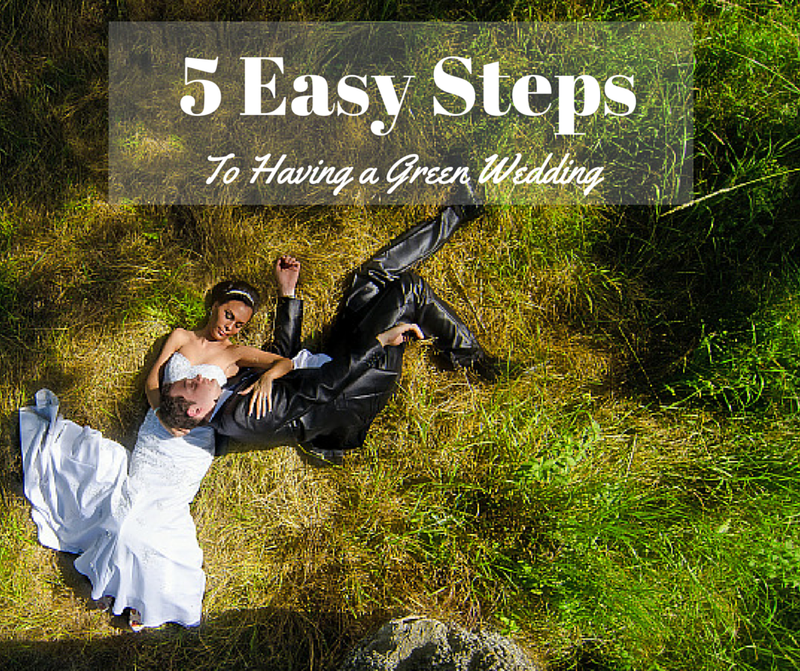 We’ve compiled a list of five easy green wedding tips so that you can continue to be an environmental hero even on your big day. Traditionally, paper is made using energy-intensive processes that use many harmful chemicals including bleach. The easiest way to make a big environmental impact is to simply choose wedding invitations made from recycled, post-consumer paper. By choosing recycled paper for your wedding invites, you’re eliminating waste products from the environment and saving the energy required to process and refine normal paper. Best of all, your wedding invitations will have a unique and handcrafted appearance that your friends and family are sure to appreciate and remember. It’s hard to picture a wedding without flowers, but have you ever considered the environmental consequences of growing and selling flowers in bulk? Flowers require massive amounts of water to grow and keep alive, and growers oftentimes utilize harmful pesticides to grow such pristine specimens by the thousands. Additionally, in order to have flowers shipped to retailers, precious resources like gasoline have to be spent. But there’s hope. Look for local organic growers in your area, buy flowers when they are in season or consider using non-traditional arrangements that don’t utilize flowers at all. The problem with traditional gowns is that they are manufactured with artificial materials and bleach, both of which aren’t environmentally friendly. Additionally, you’ll only wear your dress one time, which means that hundreds of thousands of wedding gowns are manufactured in this manner year after year. Instead of spending your hard-earned cash on a dress that you won’t re-wear, consider the green alternatives. Opt for a vintage gown that’s been worn before, consider attire that could serve another purpose in the future or look for designers in your area to create a gown from environmentally sound materials like hemp and cotton. The saying “You Are What You Eat” is even more true now than it ever was. Modern and convenient foods have become a mainstay in the American diet and have done as much damage to our environment as to our waistlines. Between factory farming and the many miles our food now travels before it finally hits the table, consider the difference you’ve made each time you buy local and organic foods. You don’t have to sacrifice your efforts simply because you’re providing foods for friends and family instead of just yourself. When hiring a caterer, look for someone who will utilize local resources and buys in-season produce. If a big menu is out of your price range, consider making small changes here or there or simply opt for an appetizer or dessert menu. Wedding favors have become such a deeply engrained tradition in wedding culture that we hardly even stop to consider what happens to those little bits of paper and plastic after the ceremony. Chances are, most wedding novelties will end up in the trash soon after your wedding or at some point years down the road. But don’t blame your guests for not appreciating your efforts quite yet. Instead, consider giving them a gift they’ll actually use and appreciate. This could include small edibles, soaps or a selection of tea or herbs. If you’re stuck and out of ideas, consider simply making a small donation in each guest’s name to a charity of your choice. There are many more changes you can make to have your wedding be a green one. We’d love to know how you did it. Share your stories with us in the comments below! The best flowers and arrangements!!! Got a $20 arrangement filled with 2 Sunflowers, 2 calla lily, 2 tiger lily and a few other ones. 9 days later they are still alive. My mom loves this Flower Delivery NYC. The florist there was so nice and awesome with creativity.